UPDATE May 9, 12:30 p.m. ET: The May 5 launch was scrubbed. A May 8 attempt was also scrubbed. The next attempt is tentatively slated for May 19. The article below remains as originally written, and further updates will be available from NASA here. Should a rocket blast off on schedule early Tuesday evening from NASA's Wallops Island Flight Facility in Virginia, a potentially spectacular sight might be visible across a wide swath of the U.S. Eastern Seaboard, weather permitting. It would be only the third attempt at launching an orbital rocket from this coastal Virginia range – located just south of Assateague Island – in the last 13 and a half years. The first time NASA attempted an orbital launch from Wallops, in October 1995, the liftoff of a 50-foot-tall Conestoga rocket ignited normally, but the vehicle exploded over the Atlantic just 46-seconds later. A problem with the rocket's guidance system was blamed. Then in December 2006, a 69-foot-long, 5-foot wide, 35-ton, four-stage Minotaur I rocket successfully launched the TacSat-2 satellite, carrying a semisecret payload from the Pentagon's Missile Defense Agency. Now another Minotaur I rocket awaits liftoff from the Wallops Flight Facility Tuesday, May 5, no earlier than 8 p.m. EDT. A home video of a Minotaur launch out West in 2005, shot by Doc Searls with his son, shows they can be spectacular crowd-pleasers. While many Westerners are fairly familiar with such sightings, they are all but unknown in the East and so may end up surprising millions of people should the Minotaur I lift off on schedule. The chief goal of this flight is to place the 880-pound TacSat-3 satellite with its trio of payloads that will offer real-time imagery (within 10-minutes of collection), sea-based information transmitted from ocean buoys and plug-and-play avionics to assist warfighters in keeping one step ahead of their adversaries. In addition, three "cubesats" will be launched as secondary payloads on the TacSat-3 mission. A launch window from May 5 to 9, from 8:00 p.m. to 11:00 p.m. EDT each day, has been established to take into account bad weather or equipment glitches (see "Final Points" below). A launch after 8:00 p.m. EDT would occur just after sunset along the entire Atlantic Coastline. Over the years, similar rocket firings have routinely taken place from California's Vandenberg Air Force Base. 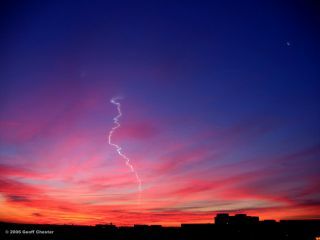 Rocket launches that have occurred around the time of sunrise or sunset have left long, glowing contrails in their wake that have been seen for a few hundred miles across the Desert Southwest; often becoming contorted by high level winds into strange and exotic patterns and sometimes, prismatic colors. Based on a very similar launch from Wallops Island in December 2006 and similar dusk and dawn launches from Vandenberg as a guide, I've determined that it should be possible that Tuesday's post-sunset launch may be visible as far north as southern Maine; as far south as northeastern Florida and as far west as eastern Kentucky. The rocket will be launched on a southeast trajectory. Approximately six minutes after launch it will be passing north of Bermuda. Three minutes later it will reach orbital altitude over the middle of the North Atlantic. Observers who are situated within about 800 statute miles of the Wallops Island Flight Facility appear to have a reasonable chance of catching a view of the Minotaur I contrail within the first few minutes after launch. The key to making a sighting is to have a clear, unobstructed view of the horizon in the direction of Wallops Island. For example, a viewer in Raleigh, North Carolina should look toward the northeast; in Boston, Massachusetts look southwest; in Wheeling, West Virginia it will be due east. Areas farther to the northeast (toward southern New England) have an advantage since skies will be darker – sunset will come somewhat earlier than it will along the Mid-Atlantic Coast. At Wallops, it's at 7:57 p.m., but from Boston it's at 7:49 p.m. Farther to the west, across the Ohio Valley the Sun will still be above the horizon so the launch may only be barely visible, if at all against the blue daytime sky. But should the launch be delayed by just 30-minutes, sunset will arrive, sufficiently darkening local skies. The Minotaur I is a launch vehicle sometimes called "half man and half beast" because it combines features of the Minuteman missiles and Pegasus rockets. It also merges space technologies designed for both military and commercial ventures. Another factor in this launch is the upcoming May 11 launch of the Space Shuttle Atlantis at Cape Canaveral, Florida. According to Wallops Public Affairs officer Keith Koehler, the Wallops tracking systems are needed to support a shuttle Launch. "We have to stand down because of the Space Shuttle launch. We have assets that support the launch. Then I believe there is another launch at the Cape that will be using assets that we use." Wallops is NASA's cynosure for tracking orbital payloads and receiving meteorological information relating to North America. And although it has never been used for this purpose, Wallops can also boast that its 8,750-foot runway, usually reserved for winged-aircraft safety tests, is an approved shuttle emergency-landing site. The latest launch updates are available from NASA here.